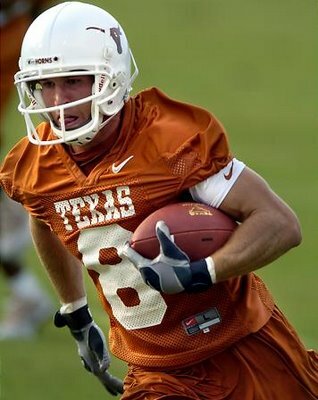 Jordan Shipley was one of the Longhorns top recruits in the class of 2004 out of Burnet (Texas) High School. Ever heard of him? They say he's great. He's suffered two season ending injuries (one for each leg) in 2004 and 2005. But he's still the most talked about Longhorn player who's never seen the field. And with good reason. He was ready to play for the Horns right out of high-school after becoming the all time leader receiver in Texas high school history. Shipley caught 264 passes for 5,424 yards and 73 touchdowns. As a senior, Shipley caught 95 passes for 1,920 yards and 30 touchdowns. He was a two-time first-team 3A all-state selection and a 2004 Parade All-American, he is No. 2 all-time nationally in receptions and touchdowns. He once caught 13 passes for 250 yards in a high school game and scored by rush, reception, punt return and interception return in another.